WASHINGTON, D.C. AND CLEARWATER, FLA., (Dec. 8, 2017) — Westchester Gardens Health & Rehabilitation, a skilled nursing community in Clearwater, Fla., managed by The Goodman Group, has received the highest possible overall rating of five stars by U.S. News & World Report’s “Best Nursing Homes,” available exclusively at www.usnews.com/best-nursing-homes. 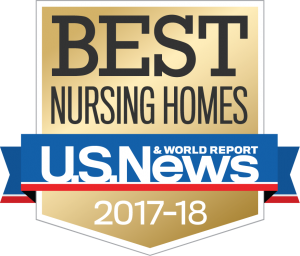 U.S. News & World Report evaluated over 15,000 facilities across the country and just over 2,000 earned the designation of Best Nursing Homes 2017-18. U.S. News’ goal is to help families find a good and caring facility for their loved one. According to U.S. News & World Report, roughly 1.4 million individuals, including 1 in 10 individuals age 85 and above, will wake up in a U.S. nursing home. To create Best Nursing Homes 2017-18, U.S. News drew on data from the Centers for Medicare & Medicaid Services (CMS), the federal agency that assesses nursing homes in three categories – state-conducted health inspections, nurse staffing and medical quality measures. CMS then assigns homes an overall rating of one to five stars based on their performance in those areas. U.S. News awarded the “Best Nursing Homes” designation to facilities that earned an overall four and half stars and above. In addition to releasing the Best Nursing Homes for 2017-18, U.S. News & World Report also released its new Nursing Home Finder that offers comprehensive information about care, safety, health inspections, staffing and more for nearly every nursing home in the county.